We are making flavory chickpea flour tortillas. Chickpeas have a natural nutty flavor and can be used for a lot of different recipes like falafel or hummus. 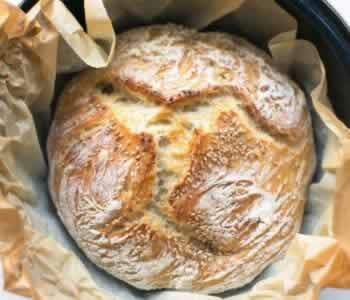 It is a great substitute for meat but can be turned into flour quite easily. Only prerequisite is that you have a good food processor and some hearing protection but more on that later. 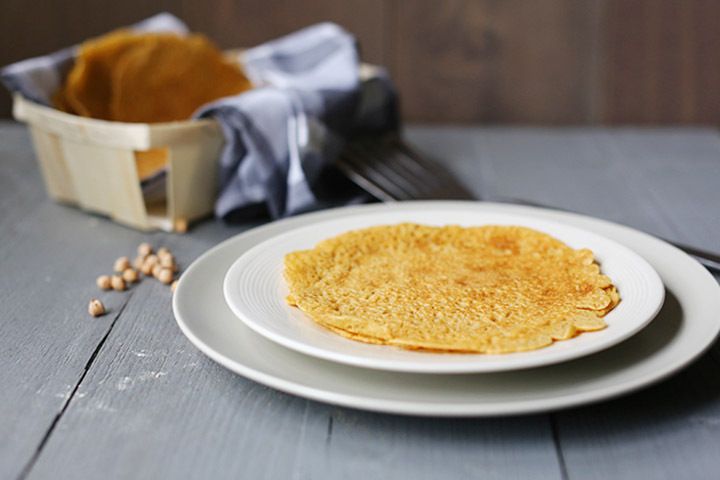 Want to learn how you can make chickpea flour tortillas? Lets get started! I wanted to make a recipe with chickpeas but could not find chickpea flour in my local supermarket so I decided to make my own flour. How hard can it be right? Well it is quite easy with the right tools but you have to take a number of things into consideration. You need dried chickpeas for chickpea flour and a good food processor. As the dried chickpeas are hard you can imagine they make a lot of noise when you start the food processor. It sounds like marbles being crushed. When you turn the food processor on either put some hearing protection on or leave the room. Depending on your food processor it takes about 30 minutes to get flour from chickpeas. Process in 10 minutes increments, then stir the chickpeas and flour and blend some more. When it looks like flour take a strainer and a bowl and sieve the chickpea flour. You can use the remaining chickpea residue and put it in water so it gets soft and use it for other recipes. 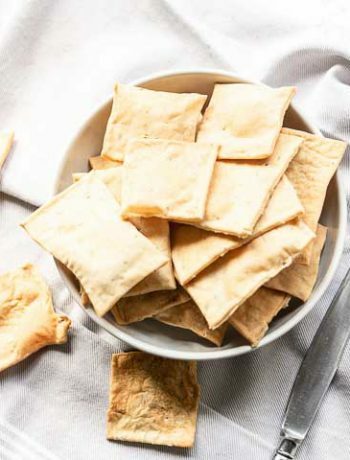 To make this recipe you start with grinding the chickpeas into flour. If you have chickpea flour at your local supermarket use that. Put the dried chickpeas in a kitchen machine. Let it run on high. With my kitchen machine it takes about 30 minutes to turn the chickpeas into flour. Sieve the grounded chickpea flour. Then it is time to make a substitute egg because we are making vegan tortillas. 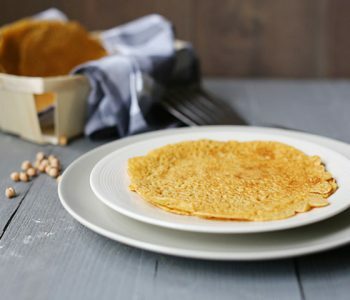 The flaxseed meal is used as a substitute for egg but if you are non-vegan you can use a small egg to create these tortillas. To make a flax egg take 1½ tablespoon of flaxseed meal (from grounded flaxseed) and add 1½ tablespoon of warm water. Leave it to set for about 5 minutes. Take the flax egg and put it in a mixing bowl. Add all the other ingredients to the bowl except the water. Slowly added the water while stirring the mixture until you have a pancake like batter. Now use pancake pan and brush vegetable oil in the pan. 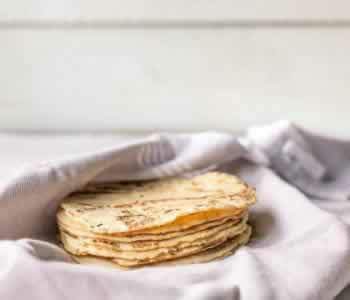 If you use a non stick it might be possible to cook the tortillas without any baking product. Cook on medium heat. Make sure the pan is hot when you put the first tortilla in. If the batter is too thick, add some water. Swirl the batter through the pan and let the tortilla heat until the surface is dry. Turn and let the other side brown. Keep warm underneath a clean kitchen towel. I made them the size of a taco but you if you take more batter you can make bigger tortillas. It sets fast so if you want bigger tortillas work fast and use a big spoon to put the batter in the pan. 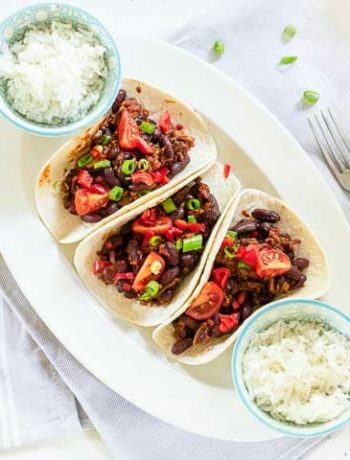 This recipe yields about 6 small tortillas or 3 big tortillas. Eat straight away or keep in the fridge (2 to 3 of days) or in the freezer. 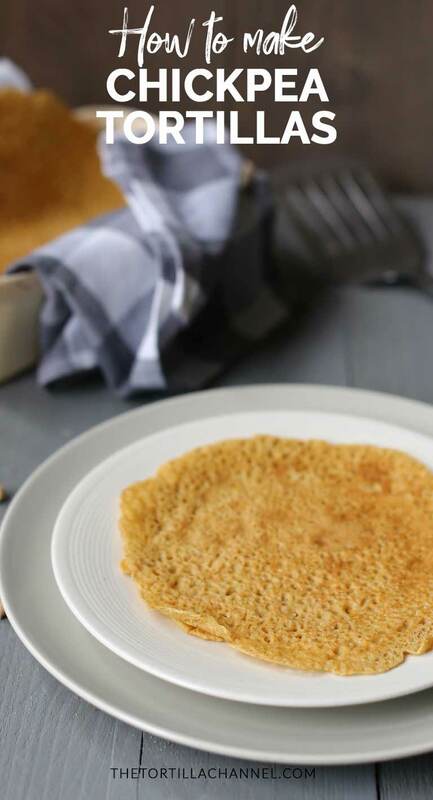 I hope you enjoy this recipe how to make chickpea flour tortillas! If you make any my recipes? Tag @thetortillachannel on Instagram or PIN on Pinterest. 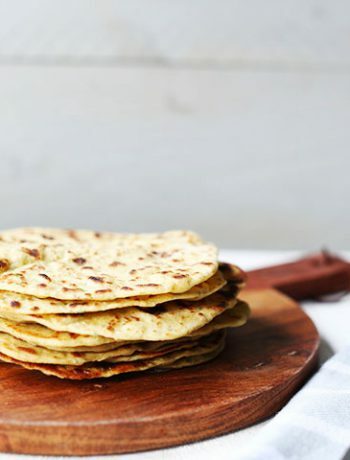 We're making chickpea flour tortillas. These are naturally gluten free and vegan. Chickpeas have a natural nutty flavor and can be used in a lot of recipes. 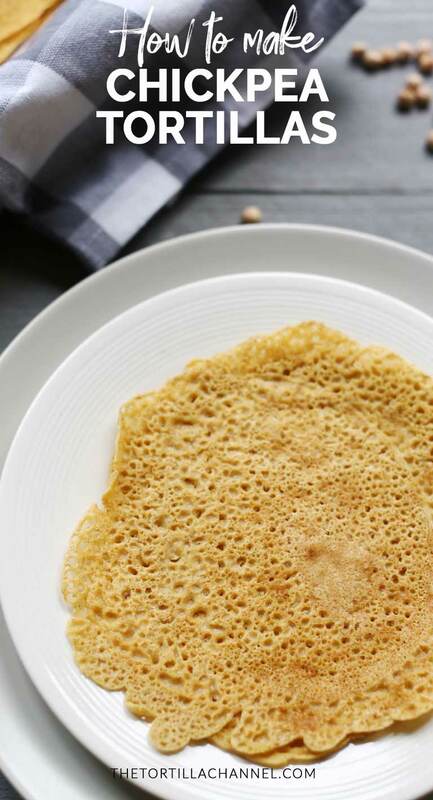 The preparation time is without the time it takes to make chickpea flour yourself. If you want to make chickpea flour from scratch add about 30 to 40 minutes depending on your food processor and how much time it take to sieve the flour. 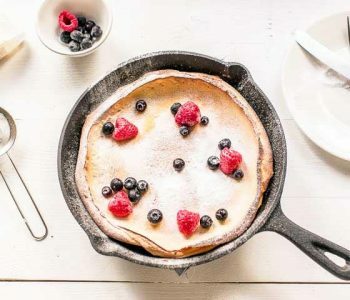 The batter should spread through the pan easily. If this is not happening the batter is to thick. Add small increments of water (a table spoon size) to the batter and whisk. The surface dries really fast so if you want big size tortillas take a big spoon. Jenny, thank you for you comment and taking a closer look at the nutriton facts. They were indeed incorrect. I have updated them with the right information. I make my chickpea flour in my coffee grinder, goes faster than food processor. I’m saving your recipe. I want to try it soon. Thanks for sharing! Thank you and what a great idea! I do not have a separate coffee grinder but this is a great reason to get one. I’m sure it will be way faster than my food processor!